oh god... did you even read the tutorial? You replace the file you want to replace in the sounddata folder with the one you exported. Open NDSeditor and make a sounddata file. Replace the old one with NSMBe. done. I think I didn't asked this correctly. replace the file you want to replace in the sounddata folder with the one you exported. What do I use for replacing the files in the sound_data folder by the files I exported? I skipped a part of the tutorial. damn it I am just stupid. You just replace them in the folder. Rename the file to the one you want to replace and then replace the sequence, bank, wav, whatever. You got a sound_data folder right?! Then copy/cut your file go into the sound_data folder using VGMTrans NDSEditor Windows Explorer and insert it (delete the old file)! Make some time I created a topic with the same problem and i got no solution, and now I decided to return with NSMB hacking and i been have the same problem. I am wanting to insert custom music in NSMB (I'm trying to put a song from SM64DS). 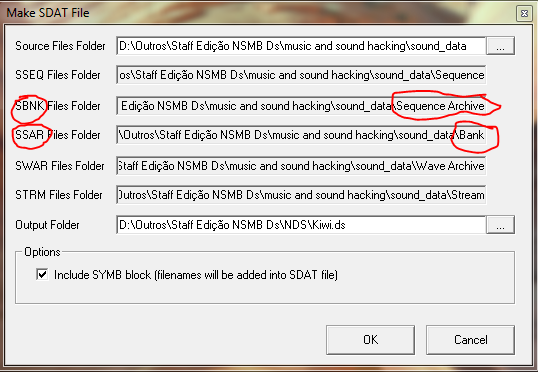 I do all the right steps in the tutorial, I select the folder "sound_data" (i'm using the Modified_Sound_Data_Folder) and send the NDS Editor to create the .sdat file. However, it always creates a. sdat file with 0 kbs, without nothing. I've done several tests and nothing changes. Could someone help me? Does the sound_data folder is in proper format? I mean, is some files lost during modification? Also, when creating .sdat file, does all sub-folders got recognized? The SBNK ans SSAR is always switched in the editor, but in reality it is normal. Don't worry. Maybe could you try all over again, like get a copy of clean modified sound_data folder and re-edit it and re-create the .sdat? I hope the problem isn't associated with the Brazilian folder name. Ok I'll try that later. I just played the NDS Editor and sound_data folder to the root of my HD partition. And it works as well. Now I can work with my custom songs. Is the maximum SWAR size for a song known? It seems that if it's too big, the sound effects start to go away. I dumbed down everything to crappy 16000hz 8 bit samples made the file around 120KB and it seems to work, but I'm not entirely sure. I once have made 200KB .swar and most of the sound effects gone. IIRC Mario sounds are still there. If 120KB works, then maybe the limit is around 128KB? My experience is that the soundeffects are working if the swar is about 110-120 KB big. But bigger swars don´t work. There's a "sound heap" in the games code where all sounds are loaded, it's somewhere in the ida db, I'll check how big it is when I get home. Some games have only one large SWAR file and SSEQ/SBNK pairs which use it. The SWAR file is 8MB in size, only a quarter of which is used by the music SBNKs. For proper size optimization, you'd need to rebuild the SWAR file and remove the SWAVs not used by any of the selected SSEQs. Helpful for swars from, like, Mario Party DS. For proper size optimization, you'd need to rebuild the SWAR file and remove the SWAVs not used by any of the selected SSEQs. Does anyone know how to do this? It will be very helpful. Some DS games have cool music, but all SSEQs ans SBNKs share the same SWAR, which is generally too huge to use in NSMB. I can't find a way to change the music on NSMBe5.exe! I use Mac OSX Mono and on the Level editor I can't find the music select option. Did you even read the tutorial? Because huh, sorry for telling the truth, but dumb post + huge dumb smiley, really.. Wait, do you mean importing a new music, or swiching musics in levels? Because inserting new music in NSMB isn't as simple as clicking on a button, you know. Can someone put all the download link for all these tools, please? It's really annoying go googling for them and I can't find them all..
please enyone do a youtube tutorial of how to add/replace and all page1 tutorioal stuff!